The September 3, 2017 underground test was North Korea's sixth, and by far largest yet, yielding some 250 kilotons, or about 17 times the size of the bomb that destroyed Hiroshima. Many experts believe the device was a hydrogen bomb—if true, a significant advance from cruder atomic devices the regime previously exploded. The explosion itself produced a magnitude 6.3 earthquake. This was followed 8.5 minutes later by a magnitude 4 quake, apparently created when an area above the test site on the country's Mt. Mantap collapsed into an underground cavity occupied by the bomb. The group then used a new analysis method developed in part by Lamont seismologist David Schaff that looks at energy waves that are much lower frequency and slower-moving seismic than those used in conventional earthquake analyses. These slow-moving waves allowed Schaff and the rest of the team to pinpoint the locations of the quakes with far greater precision than with conventional recordings. Instead of the random scatter initially seen, the quake locations lined up in a neat 700-meter-long row about 5 kilometers northwest of the blast—indication of a hidden fracture. 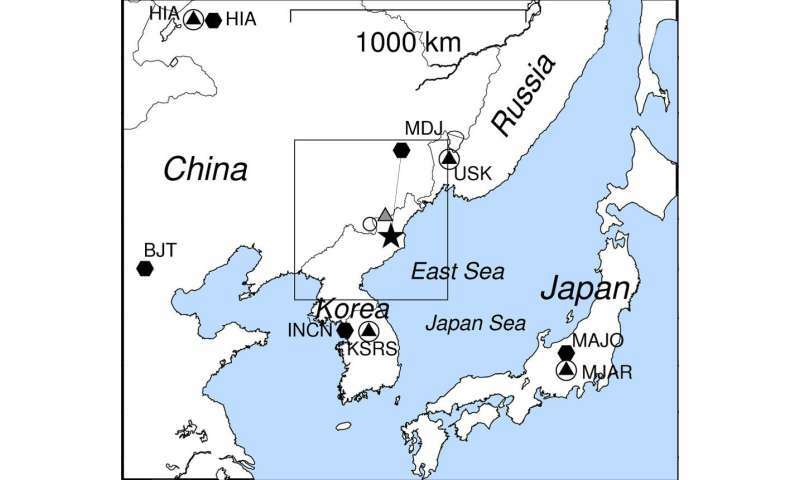 More information: 'Identification of Seismic Events on and Near the North Korean Test Site After the Underground Nuclear Test Explosion of 3 December 2017' Seismological Research Letters (2018). There will be no more nuclear quakes. Trump said so.